One of the most popular places along the southern coast of Turkey to embark from on a Mediterranean yacht charter is the lively coastal city of Marmaris. As one of the historical cities of the Carian coast, Marmaris receives a large volume of visitors each year. This favored city offers plenty for holidaymakers to do and see during their holidays in Turkey. Centrally located on the border of the Mediterranean and Aegean seas, it boasts four distinctive marinas – catering to a variety of yachtsmen and vacationers alike. From Marmaris, there are many variations for a well planned itinerary. 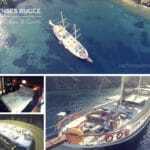 However the most popular routes that luxury yacht charter travelers choose are to Fethiye and return; Datca return and a few different routes to the Greek Islands return. The itinerary on these Mediterranean yacht charter routes, begin on a Saturday around 3:30 pm and complete the return trip on the following Saturday where guests disembark shortly after their last breakfast on the 8th day. When guests arrive they usually have some time first to settle in and receive a tour of the boat and go over their itinerary. They are also offered a welcoming cocktail or other type of drink before getting on with their yacht charter holiday. There is generally a choice to stay in the harbor overnight before beginning the cruise. This way guests have a chance to see places and stroll around the harbor area, possibly do some shopping as well. The Marmaris harbor is a busy place. The shopping, restaurants, bars and nightclubs all revolve around the harbor. There is also a lovely promenade that begins from the harbor by Netsel Marina and is quite a superb scenic stroll. An easy 40 minute walk along the promenade takes you to the next town, which is also a popular holiday hot spot called, Icmeler. Should guests arrive early enough from the Dalaman airport, and depending on the status of their yacht rental, they can easily leave the harbor and set course to their first destination. Usually this will be Cennet Island. A nearby little private bay located a mere 20 minutes from Marmaris – where they can enjoy their first dinner on board and then relax afterwards. The itineraries are listed as follows. Should you choose to head east, it will take you to the popular city of Fethiye. Along the way, anchorage points will include Ekincik, Dalyan – where you have the opportunity to visit the ancient King Tombs of Caunos. The trip then continues to Tersane Island, Manastir Bay and Kızılada. 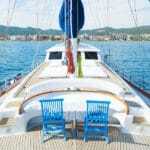 By the 4th day of the yacht charter itinerary, guests will arrive in the Fethiye harbor. The following day will take guests to the islands of Gocek and the Yassica Islands. On the 6th day guests will visit Bedri Rahmi Bay, Domuz Island and Aga Port. When the itinerary reaches the 7th day, the yacht charter will begin its return trip to Marmaris with anchorage points in Kadirga, Turunc Bay, and once again in Cennet Island. During all these lovely stops, there will be plenty of time to swimming, snorkeling, sunbathing, and other water sport activities available. However there is also plenty of time for shopping or doing nothing at all but lazing around on deck or ashore. All itineraries including this particular one are flexible – in it that guests can stay longer or shorter in one area than the next. 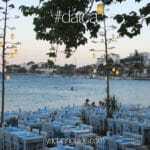 If you prefer to stay within the Marmaris region, then the Marmaris – Datca – Marmaris route is very ideal. 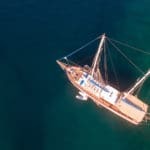 You will see plenty in natural surroundings and this route is considered quite a peaceful one, except if you wish to enjoy some fantastic nightlife entertainment in Marmaris. Alternatively, pondering the thought of visiting two countries and plenty of islands, then the Marmaris – Greek Islands – Marmaris is great one to choose. There are three variations with choice. For more details on anyone of these itineraries or custom ones, contact your professional yacht charter agent for details.